Dating back to 1909, the Stanley Hotel is a grand, luxurious hotel nestled at the foot of the Rocky Mountains in Colorado. Renowned for its magnificent colonial architecture, spectacular surroundings and luxurious accommodations, the Stanley Hotel has been drawing famous visitors for decades. Standing as the inspiration for the ‘Overlook Hotel’ in Stephen King's novel, The Shining, the hotel has featured as one of America's most haunted hotels in several books and movies. Built by F.O. Stanley, creator of the Stanley Steamer automobile, who moved to the West in 1903, the Hotel building was constructed in 1909 and was one of 11 buildings in the original complex, many of which remain in use today. 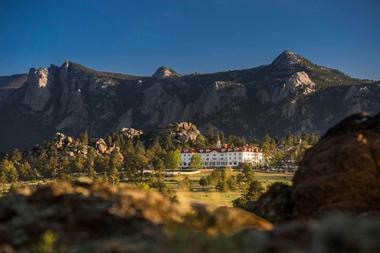 Set on 160 acres of pristine Colorado land against the dramatic backdrop of the Rocky Mountains, the majestic Georgian complex impressed the wealthy and some of its most famous residents included Theodore Roosevelt, John Philip Sousa and the Emperor and Empress of Japan. The hotel has long endured a reputation for being haunted, one which can be traced back almost as far as the hotel itself. Reports of strange occurrences and rumors that the hotel was haunted attracted Stephen King to spend a night at the historic hotel in 1974, where he was inspired to write his famous novel, The Shining. Since then, the hotel has become famous for being that hotel, so much so that each of the 160 guest rooms come equipped with an uncut version of Stanley Kubrick's 1980 big-screen adaptation of The Shining on a continuous loop on Channel 42. The hotel also offers daily historical and haunted tours throughout the year, which are extremely popular, drawing thousands of visitors each year. Nestled in the world-renowned Estes Park, the gateway to Rocky Mountain National Park, the hotel not only offers outstanding accommodations, fine dining and impeccable service but also presents an array of both indoor and outdoor activities that will keep the whole family happy. Home to lush forests, a plethora of fauna and flora and over 300 miles of hiking trails, Este Park has something for everyone, from hiking, biking and climbing to horseback riding, wildlife watching and skiing in winter. The beautiful Colonial Revival-style hotel offers 160 historic and spacious guest rooms and elegant guest suites to suit every taste and need. Designed and decorated to reflect their own character and provide the ultimate in comfort and style, all rooms feature modern amenities including 42" flat screen televisions, telephones with data ports and voicemail services, plush linens and pillows, hair dryers, irons and ironing boards and complimentary high-speed wireless Internet access. In keeping with the historic nature of the hotel, guest rooms and suite have no air-conditioning but are naturally cooled by the crisp mountain breezes. Historic Rooms are classically styled with an inviting atmosphere and feature either queen or double beds, spacious en suite bathrooms with showers and bathtubs, 42" flat screen televisions and beautiful courtyard or mountain views. Guests can relax with modern amenities, including complimentary high-speed wireless Internet access. Located in the main building of The Stanley Hotel, Classic Rooms exude the historical appeal of the hotel and include a king, queen or two queen-size beds, an en suite bathroom with shower and bath and modern amenities, including complimentary high-speed wireless Internet access. Deluxe King Rooms are more spacious than the Classic Rooms and feature king-size beds with custom made designer bedding and linens, en suite bathrooms with a large shower and Jacuzzi tub as well as modern amenities, including 42" flat screen televisions and complimentary high-speed wireless Internet access. Superior King Rooms are spacious and bright with king-size beds, custom handmade bedding and imported linens, en suite bathrooms with walk-in showers and Jacuzzi tubs and state-of-the-art technology such as 42” LG flat screen televisions and complimentary high-speed wireless Internet access. 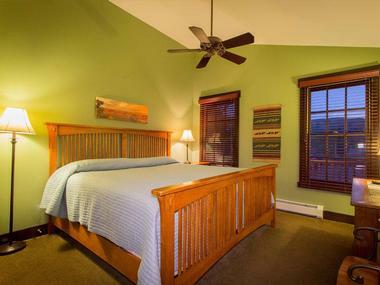 Superior King Rooms boast breathtaking views of the surrounding Rocky Mountains. Situated in the main hotel building, The Lodge at The Stanley, spacious guest suites are ideal for families or groups with lovely sitting areas, large en suite bedrooms with king or queen-size beds and beautiful views. The Presidential Cottage is a study in luxury and charm with three king-size bedrooms and two-and-a-half baths on the main and upper level, as well as a kitchenette, a dining room and a living room area. A private sheltered deck runs from the master bedroom and living room and offers stunning views of the Rocky Mountains. For larger groups, two garden-level units, each with their own king bed and bathroom, can be attached to the main cottage, offering a total of five bedrooms and four-and-a-half bathrooms. The Presidential Cottage is air-conditioned. Luxurious stand-alone one, two and three bedroom condominiums are located on the grounds of the hotel and offer luxurious home-away-from-home comforts with the added services of a hotel. Units feature one, two or three queen-size bedrooms, bathrooms with showers and baths, fully equipped kitchens and spacious living rooms with pullout sleeper sofas for extra guests. 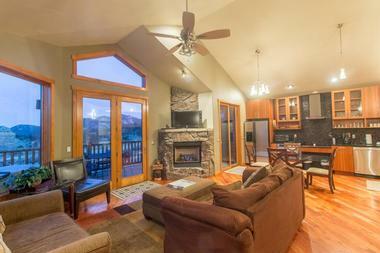 Condominiums offer stunning mountain and countryside views and additional levels of privacy and seclusion. Designed as a comfortable, elegant escape, The Lodge at The Stanley Rooms is situated next to the main building and ideally placed for soaking up the spectacular scenery of the Rocky Mountains. Built in 1910 and formerly used for housing bachelors in the early 1900’s, The Lodge’s rooms feature comfortable queen or king-size beds with designer bedding, en suite bathrooms with showers and baths, and iHome clocks with a plugin for iPhones, iPads & iPods. Guests staying at The Lodge can enjoy a delicious continental breakfast every morning in the Manor Hall. 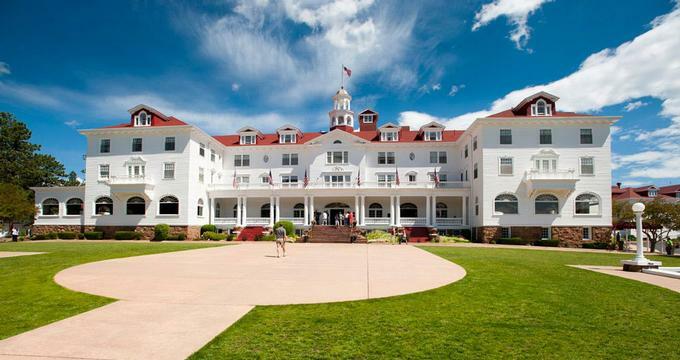 The Stanley Hotel features a variety of rooms with ‘high paranormal activity’ including the great Stephen King Suite 217 and ghost hunters’ favorite room 401, as well as several others. These are the most requested rooms and it is advisable to book one of the Haunted Rooms early. The historic Stanley Hotel features four restaurants that cater for every taste from á la carte fine dining and five-course paired dinners to seasonal al fresco patio dining patio and casual coffee shop fare. For world-class fine dining, Table is the best-kept secret dining experience in Este Park. This exclusive fine dining establishment presents a five-course paired dining experience for just 20 guests every Friday and Saturday night. Menus change weekly and feature only the freshest, locally sourced ingredients from surrounding farms, producers and artisans. Cascades Restaurant is a classic steakhouse and serves a menu of traditional American cuisine in a casually elegant setting. Open for breakfast, lunch or dinner, main menus feature fresh and innovative dishes made from locally sourced ingredients and are put together with passion and flair. Guests can dine indoors in the cozy restaurant or outdoors on the covered patio next to a cascading waterfall and sculpture garden. The covered patio also features an outdoor bar and pizza oven and is open seasonally, weather permitting. Located on the garden level of the hotel’s main building, Steamer's Café is the perfect spot for an early morning coffee and freshly baked pastry or a freshly made sandwich, smoothie or hot drink throughout the day. The Whiskey Bar & Lounge offers an elegant, relaxed space in which to enjoy light lunches and dinners, as well as excellent beverage selections. The Whiskey Bar & Lounge boasts an extensive cocktail menu of classic and traditional cocktails, as well as Colorado's largest selection of whiskeys and single malt scotches. The Bar also presents an award-winning wine program, featuring wines, vintages and champagnes from the world’s finest wine regions. Guests at the Stanley Hotel can unwind in style with relaxing and rejuvenating massages and body treatments at the full-service and exclusive Amethyst Spa. The multi-faceted, holistic spa offers a range of indulgent body treatments, massages and therapies, skin care and salon services as well as yoga classes. The Spa features an extensive, elegant space with four massage rooms, a relaxation area, a full service salon and the Cydney Springer Art Gallery. Amethyst’s spa menu includes a signature 90 minute Amethyst Spa Ritual, a variety of massages, body wraps, facials and other skin care services. The salon menu also offers an array of hair and nail care services serving both men and women, using natural and organic products. Stanley Hotel guests and non-residents can enjoy outdoor/indoor Hatha yoga classes on Thursday evenings and Saturday and Sunday mornings. Conveniently located in Estes Park, guests of the Stanley Hotel have access to a world of year-round outdoor activities, including snowboarding, skiing and sledding in the winter months and mountain biking and hiking in the summer. Outdoor enthusiasts and adventurers can enjoy hiking and mountain biking along Trail Ridge Road, fishing in Lake Estes and Mary's Lake, golf at one of the championship golf courses and cross-country skiing in the winter. For those looking for something more relaxed to do, stroll through the hotel’s beautiful sculpture garden featuring sculptures created by local Colorado artists. Guests looking for a thrill can take part in a bone-chilling night time ghost hunt or a haunted history tour of the hotel. The Stanley Hotel provides outstanding venues for conferences, business meetings, social events and weddings. With catering for every type of occasion and a range of different-size function rooms, the hotel also provides expert teams to organize every detail. You and your guests will get impeccable service, outstanding views and a one-of-a-kind atmosphere. All function spaces are air-conditioned, feature state-of-the-art technology, including high-speed T-1 connectivity, complete audio-visual services and comprehensive meeting layouts. In addition to the magnificent setting and premium services, The Stanley Hotel adds an extra touch of excellence with extraordinary cuisine. Dedicated event planners and a team of catering professionals can create themed events, awards banquets or executive power lunches, accompanied by award-winning service. The Stanley Hotel offers a variety of elegant and unique event spaces for all types of weddings, rehearsal dinners, farewell brunches and any other special occasion. Wedding packages include the use of the full-service hotel, exclusive spa, tours department and gift shop. 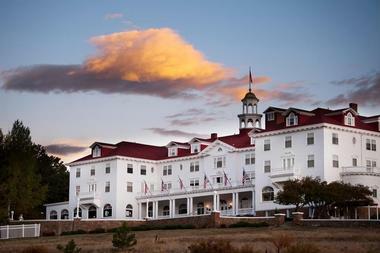 Guests can delve into the haunting history of The Stanley Hotel with one of the many tours available. The Stanley Tour is the hotel’s most popular tour, bringing the hotel’s history and architecture to life, as well as some of its most notable spirits. This daily all-purpose tour highlights the hotel’s beautiful state rooms, the hallways of the haunted fourth floor and the secret tunnel which servants used in order to remain unseen. This tour also delves into the connection between the hotel and Stephen King’s famous novel The Shining. ‘Illusions of the Passed’ is an extraordinary paranormal presentation performed by paranormal illusionist, Aiden Sinclair. Presented as a staged theatrical séance, the show touches upon matters of murder and grand tragedy, lasts between 60-90 minutes and is not suitable for young children. The Night Ghost Tour travels through the hotel’s most haunted spaces and introduces guests to the paranormal phenomena surrounding the century-old hotel with visits to the basement rooms of the Concert Hall and the famous tunnel where Flora and F.O. Stanley are still said to be seen.